The defeat of the far-right Eurosceptic Marine Le Pen has "subdued" currency traders and continued the upward trend of the Euro. Le Pen's platform was leaving the Euro, imposing trade protectionism and stopping immigration. The downfall of Le Pen has started another upward bounce for the common currency and sending it toward its next target of $110.40. The lift of the Euro is, however, negative for the US dollar. The Big dollar has been on a downward slant since the start of this year. 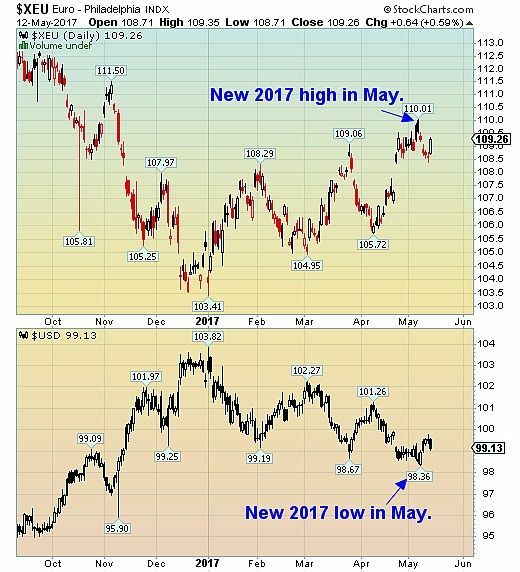 The successful win of the pro-Euro Macron has only continued the headwinds for the US$. Having fallen almost five percent since early January, the dollar now points toward a retest of the $0.985 level. Short-term price weakness in the US dollar also provides some inflationary pressure and possible stability to the beleaguered precious metal section. Gold and silver, the most sensitive commodities to the US dollar's movement, appears to have found a temporary floor. Bottom line: The win from pro-Europe Macron is positive for the common currency and therefore negative for the US dollar. The short-term weakness in the US$ also provides some minor inflationary pressure. 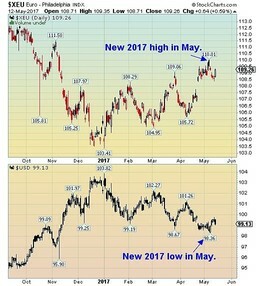 Gold and particularly silver, have benefited from the weaker US$. Models suggest gold has found a temporary floor at $1,220 and silver at $16.10. Though the outlook now appears favourable for a short-term trade on both precious metals, the catalyst (lower US dollar) is likely to be fleeting. As many components of the American economy are improving, the downward drift of the dollar is expecting to be only temporary. After this brief pullback, the projection for the US$ is for $103 which would likely end any rebound for gold and silver.